I lock my studio door on a Friday night to head to a birthday party which is already in full swing. Having savoured the first sip of wine and tamed my roaring stomach with a snack, I find myself talking to a friend who has been meaning to discuss an idea for a bag with me for a while. Ivar is a vain man in the best sense of the word. He surrounds himself with stylish, beautiful and high quality things. 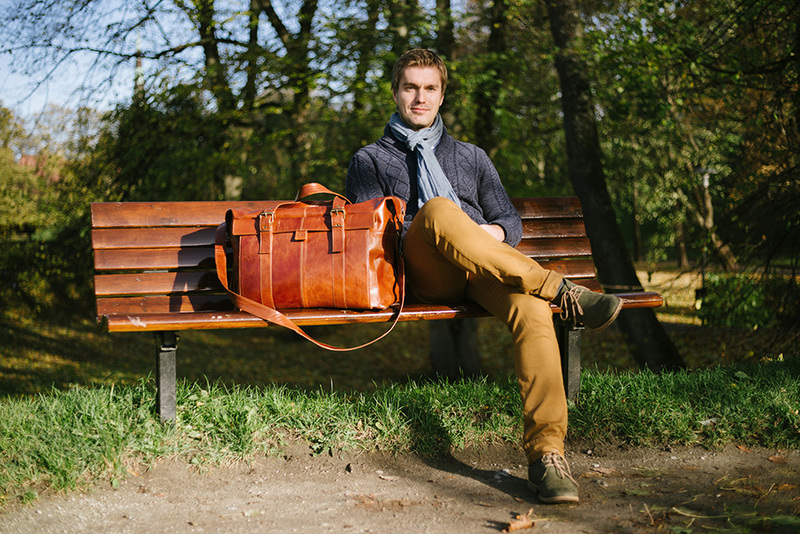 He is explicit in his opinions and determined by nature which is why – come what may – the bag had to be made of this specific type of leather. The recognition was immediate. This color! This texture! As the leather resources were limited, then my task was to cut the leather with the precision of a chemist and to construct a bag which was larger than any other weekender I had done before. Cutting the leather was a real challenge of engineering and I can say without any literary hyperbole that only three thin strips were left over in the end. But the outcome was grand indeed – Ivar can fit his whole weekend into this bag! Ivar travels a lot due to his work. He could buy the greatest weekend bags from any place in the world if he wanted to but the fact that he prefers local handicraft items warms my heart. A deep bow and my sincere thanks to Ivar for turning to me whenever he comes up with a new idea! Special thanks to Tõnu Tunnel who managed to capture the golden essence of Ivar.